Good urban planning and design are critical for making a neighborhood a welcoming place where people want to be. This is the second in a series of articles, Planning Principles, in which we provide examples of how Rosslyn has employed urban planning and design best practices to make the neighborhood a better place to be. To read the first article in this series, The Pop-up, click here. Over the past decade, Rosslyn has experienced one of the most significant construction booms in its long and varied history. Attracted by the neighborhood's convenient access to Washington, D.C., major transportation hubs and significant centers of business, commercial real estate developers have invested billions of dollars in new projects that have included residential, business and mixed-use structures. As these structures have come online, the neighborhood has been transformed into a sleek, modern and bustling hive of activity with the most distinctive skyline in the D.C. metro area. As the face of Rosslyn has changed, developers have remained committed to ensuring that new structures adhere to the highest standards of quality, particularly those encouraging new construction to be environmentally friendly and energy efficient. "Although some of the buildings in Rosslyn were constructed in the 1960s, when there was a different standard, all of Rosslyn's new construction is cutting-edge," says Douglas Plowman, the Rosslyn BID's urban planning and design manager. "Today, it's expected that new buildings will be green and seeking LEED certification." "These standards are fairly rigorous," Plowman says. "It's incredibly difficult to attain LEED Platinum status. Certification also extends to operations, and LEED buildings must be responsible in their day-to-day actions, too." Monday Properties' "The Towers" at 1000 and 1100 Wilson Blvd. 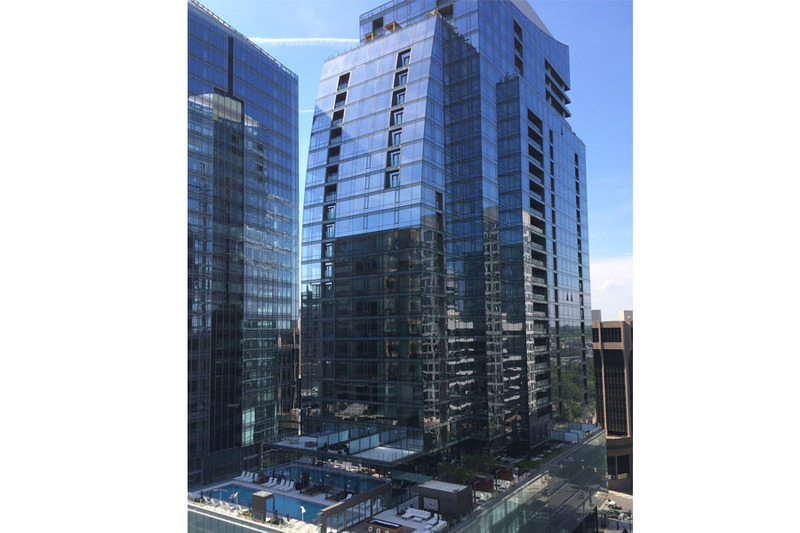 Monday Properties' "The Towers" complex features two LEED Gold certified buildings in the heart of Downtown Rosslyn. 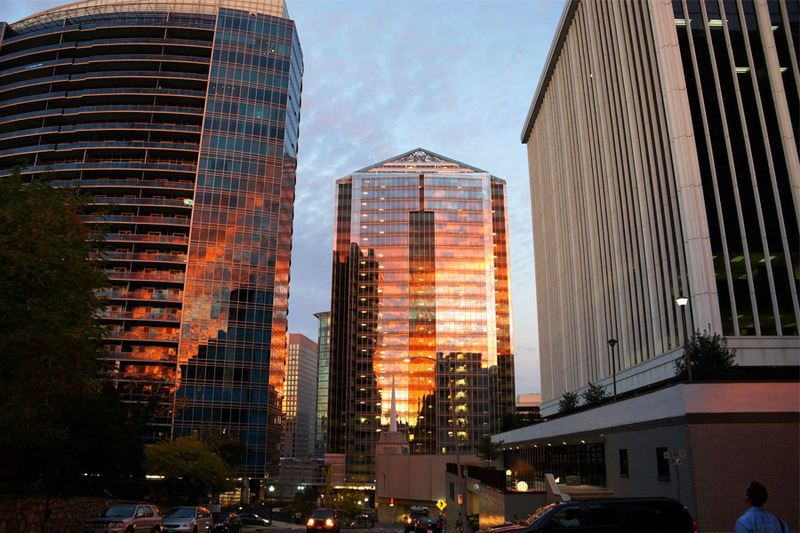 These buildings, 1000 and 1100 Wilson Blvd., score high marks in areas such as water efficiency, energy efficiency and indoor environmental quality (read more here). In May 2017, Monday Properties partnered with Greenstreet GreenWalls and AgroSci, Inc. to install the second-largest active living green wall in the United States at 1000 Wilson Blvd. The 780-square-foot living wall continually purifies the air, enhancing the day-to-day experience of building tenants. 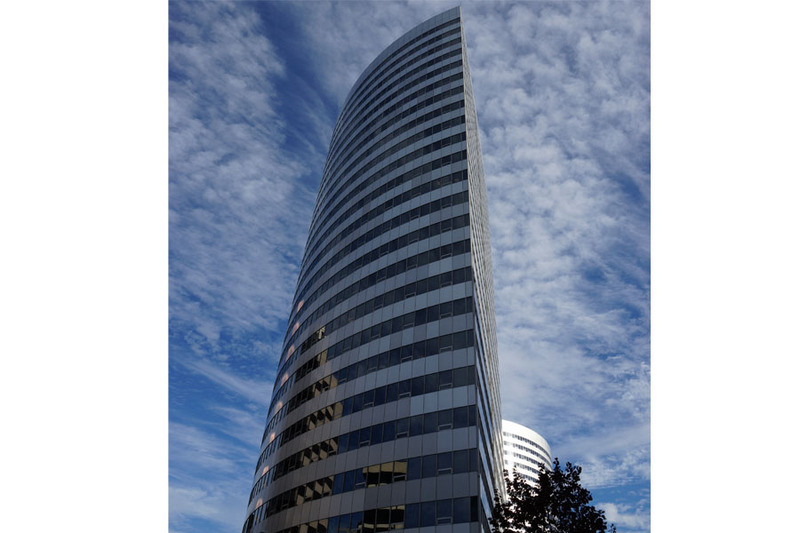 Designed by the architectural firm Beyer Blinder Belle, JBG SMITH's Central Place includes a residential tower, a commercial tower and an outdoor plaza that has been the site of numerous events, such as the Rosslyn BID's weekly farmers market and the Rosslyn Rocks! concert series. The residential tower was completed in February 2017 and the commercial tower is expected to deliver in early 2018. The residential tower is LEED Silver and the commercial tower is on track to attain LEED Gold. Key features of Central Place Residential include a green roof with water-efficient landscaping that reduces water consumption; energy-efficient appliances and heating/cooling systems in every unit; and eco-friendly wood flooring.2 Learn more about energy-efficient features of Central Place Residential here. The 35-story 1812 North Moore is the tallest building in the Washington area. It features 535,000 square feet of office space and is the future home of Nestlé USA. Designed by DCS Design, it is certified LEED Platinum for Core and Shell and LEED Gold for Neighborhood Development. 1812 North Moore has several energy-efficient features. For instance, low-flow plumbing fixtures throughout the building result in 40 percent less water usage. The building is powered by clean, renewable energy, including wind and solar power. And, 1812 North Moore uses high-efficiency lamp and electronic technology that reduce energy costs and improve lighting levels. To read about all of the building's energy-efficient features, click here. In the pipeline: Monday Properties' 1401 Wilson Blvd./1400 Key Blvd. An exciting construction project to watch is 1401 Wilson Blvd./1400 Key Blvd., which was approved by the Arlington County Board in June 2014. 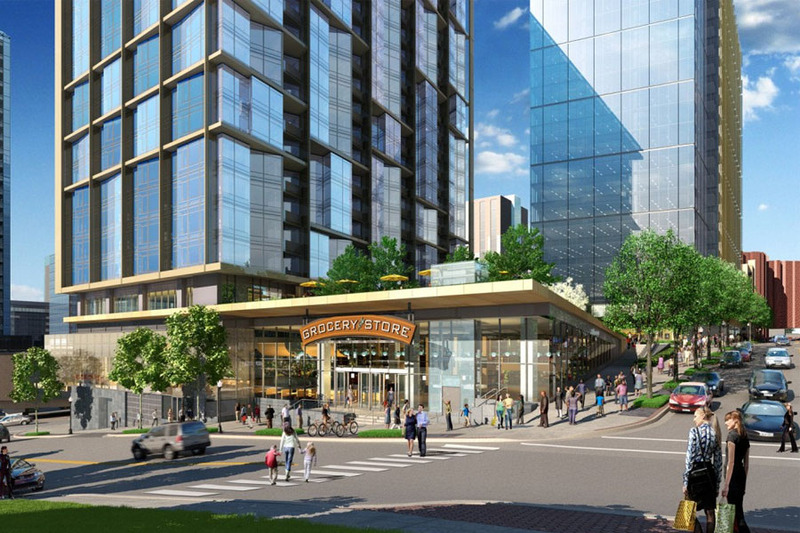 This redevelopment will transform a city block into a mixed-use center that will include a grocery store, below-ground parking and pedestrian walkways. It will have a residential tower and an office tower. The commercial tower will be certified LEED Platinum and the residential tower is expected to be certified LEED Silver. Learn more about it here. 1 This information was adapted from the U.S. Green Building Council's website. 2 This information was adapted from the Central Place website. Photo at top: The GreenWall at Monday Properties' 1000 Wilson Blvd., is the second-largest active living green wall in the United States. It continually purifies the air, enhancing the day-to-day experience of building tenants.